Be part of the future of wheelchair rugby in the South West by volunteering or playing with the West Country Hawks. Making fun, fast-paced sport accessible for anybody living with a disability, it’s easy to see why wheelchair rugby is one of the fastest-growing disability sports in the world. The Hawks enable people living in the South West to take part - and even open up the opportunity to represent GB in the Paralympics. We're delighted to be working with them and transforming lives. Why not volunteer and get involved in the Hawks' success by sharing and developing your talents? Enhance your employability skills by becoming a wheelchair rugby referee. You’ll learn everything you need to know, training with the Hawks once a week. Your training costs and expenses are all covered and, once qualified, you’ll get to go to all tournaments, including the nationals at least three times a year. Interested? Find out more about volunteering at Plymouth or contact us for more information. We’d love to hear from you. 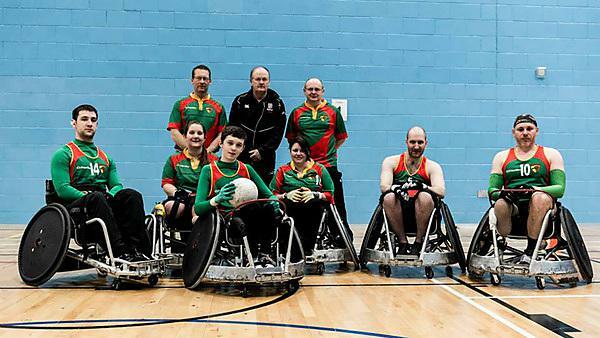 Westcountry Hawks, the only wheelchair rugby team in the South West, and currently positioned in Division Two of the National League, is excited to be recruiting. You're invited to train, socialise and become part of the team, participating in games locally and nationally, if you choose to. “We welcome everyone. Whether you show up to get some exercise on a training night, or you want to be part of the national team for GB then we can offer you an experience.” - Chris Perkins, Founder of the Westcountry Hawks. The Endeavour Hawks were formed by a group of veterans who met at the Help for Heroes Endeavour Recovery Centre in Plymouth, who were keen to play wheelchair rugby. They got in touch with the West Country Hawks and together their aim is to build a team to play in the new variant game of wheelchair rugby fives. This game is aimed at people with physical impairments/disabilities who wish to compete but do not qualify for the Para wheelchair rugby classification. The Endeavour Hawks team is made up from one able-bodied player and four physically impaired players and is supported by the Endeavour Centre as part of their road to recovery. Often their training will be alongside West Country Hawks players which include students from the University of Plymouth. The game is open to all, so anyone wishing to get involved and try something new should contact roch.rochester@hotmail.com. Studying Law at Plymouth University, plus taking on the roles of chairman, captain and player for Westcountry Hawks, Adam Simmons is an inspiration. For Adam, a car accident resulted in his needing a wheelchair, and after nearly two years in hospital it was an invite to a disabled skiing trip and an inspirational figure that revived his passion for sport. - Adam Simmons, Westcountry Hawks player. Where there is a will, there is a way. Despite Faye being in a wheelchair, this has definitely not stopped her in pursuing her dreams of being a high profile athlete, whilst studying BA (Hons) Media Arts. If you've been inspired by our thriving partnerships and you have an idea of how we could together then please tell us at partnerships@plymouth.ac.uk.